The TomTom Touch is a shower-proof fitness tracker which stands out through an unusual fat-scanning feature, but thanks to dull software and poor battery life the full package disappoints. The TomTom Touch is a fitness tracker that tries to bridge the gap between very simple step-tracking fitness bands like the Fitbit Flex 2, and the sort of advanced GPS trackers marathon runners use. It's much closer to the basic brigade, but has a body scanner feature that works out how much of you is made of fat and how much is muscle. You two are going to get uncomfortably close. While a neat idea, the reliability is patchy at best and the TomTom Touch is held back by usability issues that make this tracker less fun to use than some alternatives, but it’s not a complete write-off. The TomTom Touch costs £129.99, $129.99 (around AU$215), which puts it in the same sort of price range as the Fitbit Alta and Fitbit Charge 2, and only slightly cheaper than the TomTom Spark 3. All of those wearables also have screens, but if you can live without a display and just need basic tracking skills you can pick up a Fitbit Flex 2 or Jawbone UP3 for significantly less. However, none of these alternatives have a body fat scanner built in. The TomTom Touch looks like a generic fitness tracker band aside from the unusual silvery circle just below the display. It’s no fashion accessory and is quite thick, but is also fairly innocuous. The Touch is a plastic pebble that fits into a flexible silicone strap, much like the Fitbit Alta and a number of other trackers. It’s moderately comfortable, though we needed to adjust the fitting a few times during testing to avoid ending up with a wrist full of red indents from the sensors. You don’t want to leave it flapping about loose though, as those same sensors rely on solid contact with your skin. Some experimenting may be required to find the best fit. The TomTom Touch looks like a very simple band of black when not in use, a bit like the Fitbit Flex 2, but unlike the Flex 2 it actually has a display, one that covers most of the glossy black lozenge on the front. It’s a low-res monochrome OLED: not fancy, but it provides good clarity in all sorts of environments. Though it’s here that we stumble into the first big issue with the TomTom Touch. Its display doesn’t turn on with a waggle of your wrist, you have to press the silver button on the front to get it to wake up. This annoys, particularly as the Touch also functions as a watch, with the default screen showing you the time and how close you are to meeting your daily steps goal. Basic use of the TomTom Touch is wonky too. You flick up and down on the front of the face to get to the other screens: upwards to see your current step count, calorie count, distance travelled, last sleep duration and exercise duration. 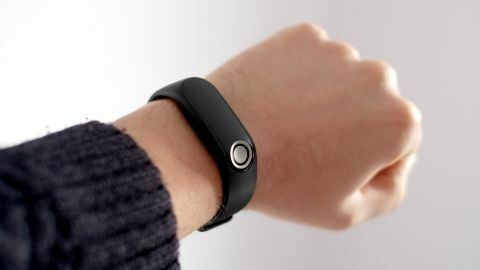 Swipes down get you to the active participation bits, the body fat scanner, heart rate sensor and exercise logger. All this seems fine aside from using a lot of screens (and therefore swipes) to show just a few basic figures, but the TomTom Touch display often also doesn’t respond to gestures. The little guy doesn’t seem to like being woken up at times. It is water-resistant, though. Despite having an exposed micro USB port in the main unit and, as far as we can see, only a minimal rubbery lining, it’s IPX7 certified. That means you can wear it in the shower without worry, though it’s not waterproof enough to swim with.